RSLinx software is a communication server package that provides plant-floor device connectivity for a wide variety of applications. RSLinx software can support multiple software applications simultaneously communicating to a variety of devices on many different networks. RSLinx software provides a user-friendly graphical interface for navigating through your network. Select a device and click to access a variety of integrated configuration and monitoring tools. A complete set of communication drivers is provided for your networking needs, including Allen-Bradley networks. RSLinx® Enterprise is your preferred data server. It communicates via FactoryTalk® Live Data (our client/server communication protocol) with FactoryTalk products. FactoryTalk products and RSLinx Enterprise share FactoryTalk capabilities of security, diagnostics, audit, and redundancy. RSLinx Enterprise is typically included with all FactoryTalk products so you do not need to purchase the data server separately. RSLinx® Classic is the most widely-installed communication server in automation today. RSLinx Classic Lite can be used either as an application or service. RSLinx Classic Lite, RSLinx Classic OEM or FactoryTalk Gateway as an application provide the ability to program controllers, flash firmware and batch sequencing. 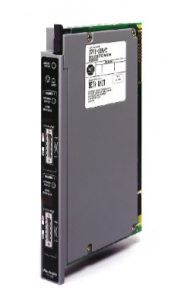 ANC-100e, RSLINX Ethernet/IP to Allen-Bradley Data Highway Plus (DH+) Gateway Converter Series. 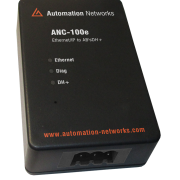 The ANC-100e is an economical and high performance, “pocket-sized” converter interfacing Factory Automation Devices between Ethernet/IP and PLC-5s & SLC-504s on Allen-Bradley Data Highway Plus DH+. Fast data service recovery after redundant controller switchover or network disruption. Two new shortcut types (EDS Parameters and Symbolic). Support of complex paths: A complex path is one which starts on one protocol and changes before reaching a device. IP address filtering provided giving user the ability to enter part of the IP address and the first address that contains the type string will get displayed. Shows ALL possible IP Addresses on subnet which allows you to build node table list instead of manual entry. Provides ability to backup and restore the same configuration, including Ethernet bus to multiple machines without manually re-browsing the driver configuration. A list of communication devices and their settings (for example, node, baud rate, and alike). Device drivers and their associated properties. A list of potential target devices, with which RSLinx Enterprise can communicate (that is, exchange data). Shortcuts. A shortcut is a name that stands for the device you want to connect to, and the data that device contains. The communication path associated with the shortcut tells the application where to find that data. For FactoryTalk View Machine Edition applications, you can pre-configure RSLinx Enterprise-based communications needed for the runtime applications, using the design software, FactoryTalk View Studio.You can also edit configurations, using Windows CE-based tools on the PanelView Plus terminal. RSLinx Enterprise provides the following features and benefits: · Provides access to controller and device data from any FactoryTalk Live Data client. Offers a variety of communication drivers and routing options. Supports Local applications (also called stand-alone applications) for smaller systems, and Network applications (also called distributed applications) for larger systems. For Network applications, provides the option of specifying a secondary, or redundant, server to take over when the primary server fails. Provides editing capabilities outside of FactoryTalk View Studio. You do not have to install FactoryTalk View Studio to edit RSLinx Enterprise configurations. Use FactoryTalk Administration Console, which is installed with FactoryTalk Services. Installs and supports FactoryTalk Alarms and Events. Refer to the Help for more information about FactoryTalk Alarms and Events. Supports FactoryTalk Security to provide a means for system administrators to control access to resources (such as applications or areas), or the ability to perform tasks (such as read and write) in the automation system. In conjunction with FactoryTalk Gateway, provides standard OPC connectivity into the FactoryTalk system for third-party products. For more information about FactoryTalk Gateway, refer to the FactoryTalk Gateway Help. It is important to understand some basic concepts about FactoryTalk and RSLinx Enterprise before you begin working with RSLinx Enterprise within the FactoryTalk Administration Console. For more detailed information about FactoryTalk, refer to the FactoryTalk Help. FactoryTalk Services Platform Formerly known as FactoryTalk Automation Platform, the FactoryTalk Services Platform is an underlying architecture and set of services that Rockwell Automation software products build upon. Provides common services (such as diagnostic messages, health monitoring services, access to real-time data) and shares plant resources (such as tags and graphic displays) throughout an automation system. Allows defining plant-floor resources once, and then allows simultaneous access to those resources across product boundaries. FactoryTalk Directory FactoryTalk Directory allows products to share a common address book, which finds and provides access to plant-floor resources, such as data tags and graphic displays. FactoryTalk products across multiple computers on a network. FactoryTalk Live Data FactoryTalk Live Data manages connections between FactoryTalk products and data servers. It reads values from, and writes values to, OPC-DA servers (OLE for Process Control – Data Access) and Live Data servers on behalf of client software products, such as FactoryTalk View and FactoryTalk Transaction Manager. FactoryTalk Diagnostics FactoryTalk Diagnostics collects and provides access to activity, status, warning, and error messages generated throughout a FactoryTalk system. FactoryTalk Administration Console FactoryTalk Administration Console is an optional, standalone tool that enables you to configure and manage FactoryTalk-enabled applications. FactoryTalk Security FactoryTalk Security offers centralized security services that provide the ability to control access to your automation system. For more information on configuring FactoryTalk Security, refer to the topic titled About “FactoryTalk Security” in the RSLinx Enterprise Help. Local applications versus Network applications An application organizes project information, including elements such as data servers, HMI servers, and alarm and event servers. The application makes project information available to all FactoryTalk-enabled products participating in a FactoryTalk system. Network applications are held in a FactoryTalk Network Directory. Project information and participating software products can be located on multiple computers distributed across a network. All of the computers participating in a particular Network application share a common Network Directory Server located on a network computer. In a Network (distributed) application, you can use either FactoryTalk Administration Console or FactoryTalk View Studio. In a Local application, you can edit locally or remotely using FactoryTalk Administration Console, or you can edit locally or remotely within FactoryTalk View Studio. To edit a FactoryTalk View ME (Machine Edition) project, use FactoryTalk View Studio because of the specific needs of FactoryTalk View ME. Design-time versus runtime RSLinx Enterprise is comprised of design-time and runtime components. The design-time components provide the user interface that enables you to set up devices, drivers, and shortcuts that are ultimately used by the runtime components. Based on this configuration data, the runtime components execute read/write requests received during runtime operation. RSLinx Classic is available in four versions to meet the demand for a variety of cost and functionality requirements. Depending on the version you are running, some functionality may or may not be operational. Refer to the following sections for specific version functionality. The RSLinx Classic version you are running appears in the title bar at the top of the main window. If a version of RSLinx Classic is started without the proper activation files, it runs as RSLinx Classic Lite. Ladder logic programming using RSLogix products. Network and device configuration and diagnostics using RSNetWorx. Configuring Ethernet modules and devices (for example, 1756-ENET, 1756-DHRIO, and so on). Browsing networks and getting device information such as firmware revision. RSLinx Classic Single Node includes the required functionality to supply communication services for all Rockwell Software products. OPC and DDE interfaces are supported, but to only one device. It does not support applications developed for the RSLinx Classic C API, or direct drivers in HMI applications. RSLinx Classic OEM or higher is required for these application types. Data acquisition using OPC or DDE to only one device. This includes clients such as RSView32, FactoryTalk View SE, FactoryTalk View ME Station, Microsoft Office, Visual Basic, and web pages. Data acquisition using OPC or DDE to any number of devices. This includes clients such as RSView32, FactoryTalk View SE, FactoryTalk View ME Station, Microsoft Office, Visual Basic, and web pages. Multiple RSView32, FactoryTalk View SE, and FactoryTalk View ME Station clients accessing data through one RSLinx Classic Gateway (remote OPC). Remote computer running RSLogix connecting to a plant network over a modem for online program changes. Remote Microsoft Office applications showing plant floor data such as Excel. A web page showing plant floor data when the web server and RSLinx Classic are on separate computers.